Tesla rumoured to be creating its own streaming service | What Hi-Fi? The car manufacturer wants to have its own system that could theoretically integrate other services such as Spotify, Apple Music and Pandora. 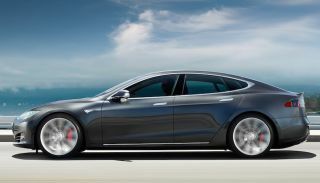 Tesla, a company known primarily for manufacturing electric cars - such as the Model S pictured above - is apparently licensing a proprietary music service that would come bundled with its cars, according to industry sources. The cars, which come with internet connectivity, will apparently have multiple tiers of service from other music streaming apps, starting with an online radio offering similar to Pandora in the US. However, this doesn't quite answer the obvious question of why Tesla isn't planning to integrate existing services such as Spotify and Apple Music further into its ecosystem. Whether the streaming service happens, and how successful it will be, remains to be seen - but hopefully the car will have a good sound system built-in.